User-centred Community Engagement - Pilot Methodology — eclipse experience Ltd. This section details the two components of the User-centred Community Engagement and the methodology trialled in displacement camps in Bangladesh and Iraq. 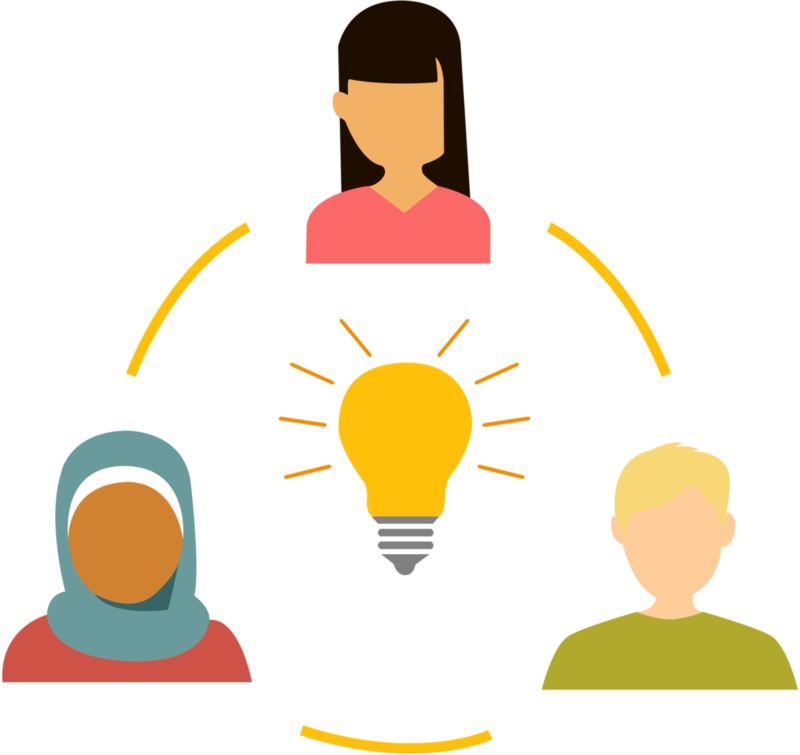 User-centred community engagement in rapid-onset emergencies needs to explore people’s needs in-depth whilst engaging with as many people as scarce resources allow. This can be achieved by using a combination of interactive surveys and participatory co-creation sessions. Deployed on tablets, the interactive surveys are designed to engage community members quickly and effectively to identify their priority humanitarian needs. Surveys can be tailored to the specific needs of a particular organisation, context, programme or community. 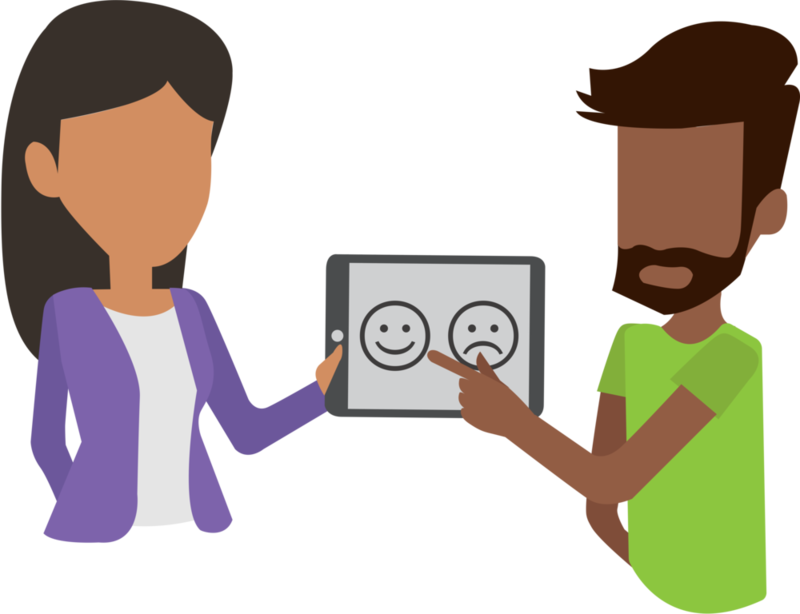 For example, when used to engage children or people with low literacy skills, surveys can include smiley face rating scales to help respondents prioritise their needs, or they can be set up to collect important household-level information from adult caregivers. Interactive illustrations are a core feature of the digital surveys, making them highly adaptable and inclusive. Illustrations allow survey respondents to identify the so-called “pain points” by tapping anywhere on the tablet screen. This helps field staff to avoid limiting possible survey responses to a list of predetermined problem areas, enabling a more complete and nuanced identification of needs. Follow-up questions are determined by where respondents tap on a given illustration and allow users to briefly explain their choice and identify how much of a challenge it poses for them at the moment (“pain rating”). All survey responses can be recorded in an offline mode and uploaded to the server once the internet connection becomes available. The uploaded data is then automatically analysed and reported in a template predefined by agency staff depending on their programme design needs. 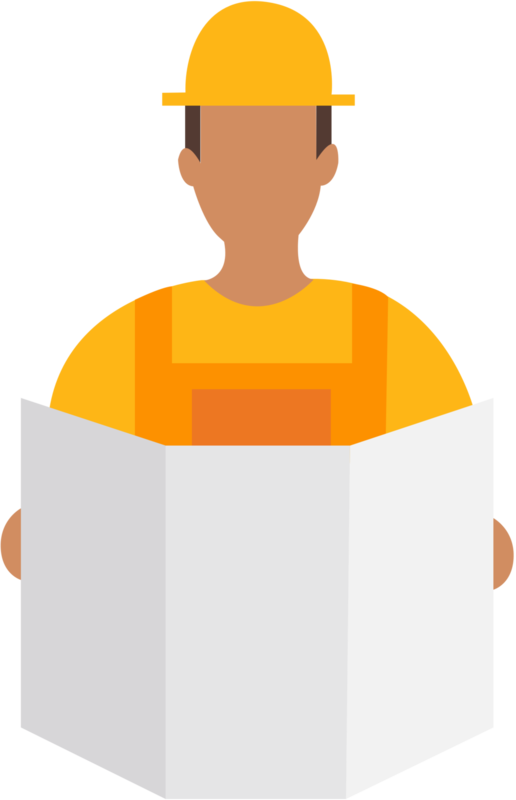 The insights from interactive surveys help humanitarian staff gain initial understanding of issues from a large sample of members of their target community. The initial understanding is then taken into community co-creation sessions with children and caregivers. Depending on cultural contexts, the sessions are conducted separately for caregivers of different genders and children of different ages. 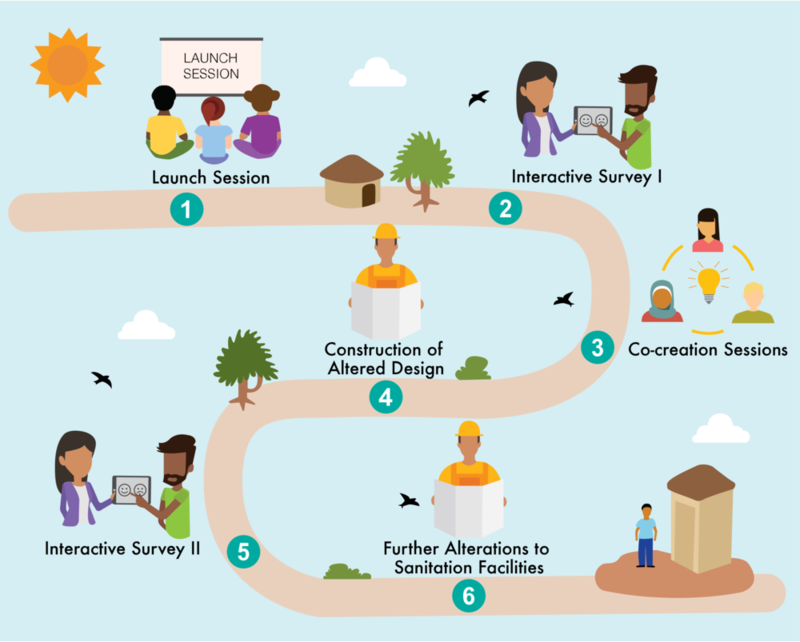 Activities such as 5 Whys, H-Assessments and dot voting are used to explore pain points in more depth, capture current sanitation behaviours and to develop and rank potential improvements to sanitation designs with the community. The session also enables interaction with WASH engineers and other decision-makers so that community insights and input can directly influence sanitation design alterations. Co-creation sessions also create the opportunity to help manage the expectations of affected people. It may not be possible for aid agencies to implement all of the solutions that children and caregivers suggest; however, it is important to explain why that may be the case. Honest discussions during co-creation sessions can promote more collaborative and transparent relationships between aid agencies and affected people. The way the components are combined to complement each other can be adapted according to contextual factors of the response (e.g. scope, budget, cultural factors). For the pilots in Iraq and Bangladesh we combined them to form the following methodology with focus on informing the design of child-friendly sanitation facilities. Training on the use of the methodology took place on 1.5 days only and included hands-on practice sessions for the use of the Digital Tool and the Co-creation sessions. The Eclipse and Save the Children project team conducted the training and supported the back end of the Interactive Surveys. All activities were managed by the field team in order to assess the feasibility of the methodology. The implementation of UCCE begins with a training for the field team (1-2 days). During the training the staff are introduced to the methodology and its components and are given an opportunity to practice using the digital interactive surveys with each other and during practice sessions with a small sample of community members. Staff also participate in trial co-creation sessions. Certain details of the methodology can be adapted on the go if they are found to be unsuitable during the training period. A community gathering with the primary user group (children aged 5 -12 years), their caregivers and community representatives is the beginning of the engagement. It aims to build a relationship between the field team and the affected community, introduce the engagement, and represents an opportunity to address any potential participation barriers. Trained field staff conduct the first interactive survey using the Digital Tool with children and primary caregivers in camp households for 3 - 4 days. The automatically produced report is reviewed by WASH engineers and the main pain points identified are taken into the next phase of the engagement. The humanitarian field team and local facilitators run community co-creation sessions with children and caregivers. 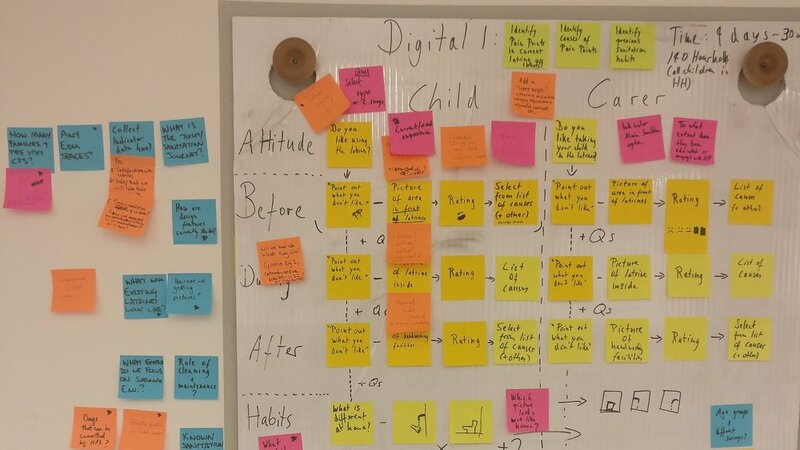 Data captured in Digital Engagement I informs participatory activities, e.g., 5 Whys exercises and H-Assessments, to explore pain points and decide on design changes in a participatory way with the community. WASH engineers review the design changes co-created with the community for feasibility and decide on which changes are implemented. Materials are procured and construction of new facilities or alterations to existing facilities are carried out. A second interactive survey is deployed for 3 days using the Digital Tool. It engages children and caregivers in their camp households and focuses on collecting feedback on the altered designed construction from affected people to identify whether there is a need for further alterations or actions to improve the latrines further. It also measures changes in user satisfaction with the implemented alterations or newly constructed latrines and their trust in the implementing organisation’s ability to listen and act on their design suggestions. Further alterations to sanitation facilities based on the output of Interactive Survey II are carried out. This represents the end of the engagement. Footer - HIF Metho. Over.